The circumstances we sometimes find ourselves in can be bizarre. I never could have imagined that one day I would wake up and think ‘I’m looking forward to going to an Old People’s Home to massage the leprosy afflicted residents’. But nonetheless today was that day, my third on the job. 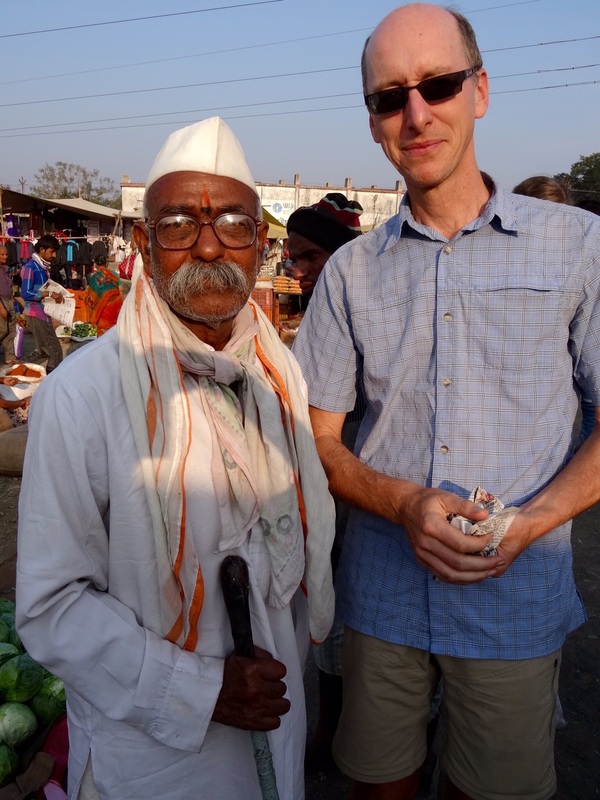 After our arrival at Anandwan we had been given a guided tour of the whole community. As Old People’s Homes go it was basic in the extreme with dormitory-style rooms housing up to 10 men or women per room. The beds were of a painted iron construction with simple cotton-filled mattresses, old and tattered sheets and a stiff woollen blanket or two. What possessions existed were stacked on shelves or arranged along the window sills. Yet in spite of the spartan conditions there was an upbeat mood which our presence seemed to add to. Hands were raised in greeting, there were big smiles and I was strongly reminded that I had been in far more depressing old people’s homes in the UK. The first day of work, actually the first moment, was the biggest challenge. The four of us had walked up there with Zohar our retreat facilitator thinking that she would settle us in. Instead we were left at the entrance and were for a moment rudderless. My instinct on these occasions is the same as it is for getting into cold water. No slow lowering in for me but a quick dive into the deep end. So with a cry of ‘Let’s go and make some old men happy’ I headed into the main courtyard immediately spotting an old man who had sung a Hindi devotional song for us during the tour. He raised his hands in greeting and I asked ‘Malish’ (massage). He did a head wobble in the affirmative and I got the mustard oil out. For a split second a whole hubbub of superstitious claptrap about Leprosy rose up in me. Then my hands were on him and the edge receded. Since that first morning I have rubbed oil onto a staggering variety of body parts, some barely recognisable. Fingerless hands and toeless feet. Muscles as hard and unyielding as car tyres. There have been lumps and bumps and stumps. Skin hanging off in folds like sheets of rolled dough or looking like cracked mud. Dry leathery hides that resembled those of elephants more than men. Often there is pain around certain areas so we have to listen carefully for a wince or a cry of “Dukta’ – pain. Paradoxically though many believe that unless the massage is hard and causes pain it will not be beneficial. A dilemma. But already I have fallen for these old warriors of Maharashtra. The first one to touch me was a rather stern looking old man sitting on his bed in a corner of one dormitory He pulled off his grey-tinged white shirt and pointed abruptly to his back. As I worked on him he was making quite a few what sounded to me like disgruntled noises. Then amongst it all I clearly heard the word ‘Aisa’ (that’s it). So I kept going for probably longer than was his due and when I finished what a transformation. Gone the severe stare and in its place a happy beaming face. He windmilled his arms whilst speaking furiously to one and all. He then grabbed both my hands and pressed them to his forehead saying ‘Danyerbad Babaji, Danyerbad’ (Thank you respected Uncle, thank you’. Now that we have shown that we are up to the task there is a growing crowd beneath the Banyan tree. There is a lot of chit-chat in Hindi and Marathi which goes completely over our heads but we venture a phrase or two and sometimes hit on a winner: yesterday’s star phrase was ‘Angrezi Malish Wallah’ – English massage wallah (wallah = one, the person who does). We leave them glistening like freshly polished Mahogany, big smiles all round, and walk back to our rest house. My feelings have also swung in a downward direction and I have at times questioned the utility and benefit of what we are doing here. Is it of any lasting importance or just a fleeting moment of respite at the tail end of a long road of suffering? A line of gentle inquiry led me to the conclusion that although it is a mere drop in the ocean, it is a drop nonetheless and one that brings a sense of being cared for, hopefully some relief from pain, and from my experience recently, some happiness. There is also the aspect of being seen as a human being that for these outcast old people signifies a restoration of their humanity, and of all our shared humanity and sense of interconnectedness. So I often have a paradoxical mindset in that I feel like I am doing so little and yet so much at the same time. Insignificant and yet meaningful in a very powerful and transformative way. By taking myself to the edge I feel like the transition from sympathy to empathy has been accomplished within me. I no longer feel pity or feel sorrow for them but I do better understand and share their suffering. A phrase that helped me in difficult moments and still serves to ground me is ‘He has a body and a mind, just like me’. 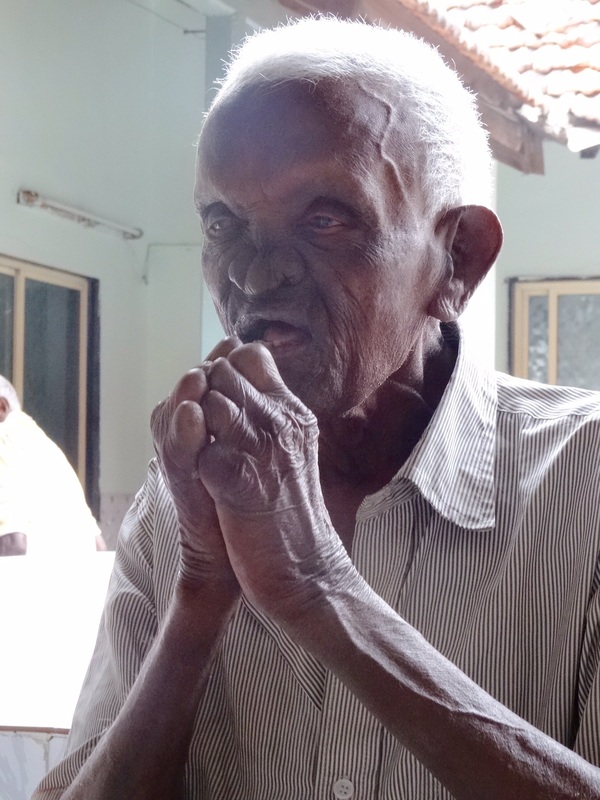 So when I am at work now I love to look into the often magnificent faces of these old Indian veterans and without expectation of reward or thanks just deeply feel the joy in giving. This entry was posted in India, Life, travel and tagged anandwan, compassion, giving, India, leprosy, Meditation, retreat by Ashby's World. Bookmark the permalink. David, I’m really enjoying sharing your fascinating odyssey. Safe travels. Hope to see you in the summer. Happy New Year up there in the snow. So glad that you are enjoying the blog as I am getting real pleasure out of posting about what we are up to. Last day on the community tomorrow and then off for some travelling. I have another volunteering stint set up helping a guy run camel safaris. It can’t be that different from bikes . . . . can it?? Hope you are getting some good cross country skiing under your belts and we WILL hook up this year somewhere in the good ole US of A.